Supporting men in regional Victoria to live better, eat better and get back into the game of life. 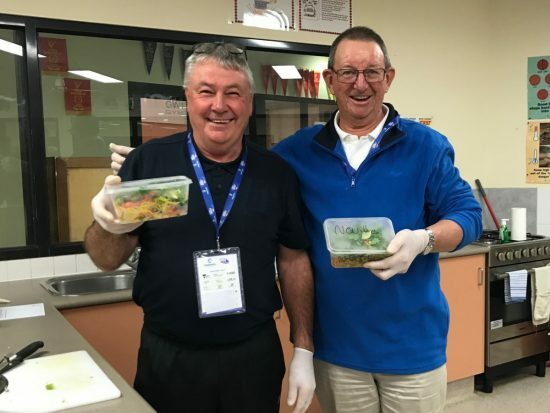 Leveraging the Western Bulldogs brand, Sons of the West is a 10 week program that partners local government, relevant peak bodies and local services to deliver a practical education program for men who want to improve their health. With HMSTrust funding, the existing model was adapted and trialled within the smaller regional setting of Maryborough in Central Goldfields. "What did I enjoy about the program? The way it was presented - it was participative, not forced. There was camaraderie, motivation, that buzz in the group exercises." Maryborough participant. The model provides a supportive and informal environment to engage with men who have not previously managed their health well. This highly successful initiative covers key areas of health management with expert guidance from community partners. Participants acquire practical information, referral pathways and new social supports. Originally aiming for 50 participants, more than 60 men joined the pilot, revealing the interest in a social and inclusive men’s health program. Central Goldfields was chosen for the regional pilot as Department of Health statistics demonstrated significant health issues for residents. Participants ranged in age from 23 years to 87 years. A key focus of the pilot was to present the program in the local context. Participants were able to make connections with local health and support agencies as well as creating connections with other participants, reducing social isolation and improving self-confidence. A range of lifestyle issues were covered across the 10 weeks including: nutrition; mental health; prostate cancer; domestic violence, masculinity and role-modelling; gambling; and cardiovascular health. Each session includes one hour of education and one hour of physical activity facilitated by exercise physiologists and occupational therapists. Outcomes were impressive with 3 in 5 participants reporting they sought advice from a healthcare professional as a result of attending the program, 3 in 4 participants feeling more confident in their ability to exercise confidently, and 4 in 5 participants reporting Sons of the West helped them to feel part of the community and to form new friendships. The Sons of the West program contains a range of incentives for participants to continue with the program. At the end of each program, a graduation takes place to celebrate the men’s successful completion. The outcomes of the Central Goldfields trial will be evaluated as part of a greater evaluation being done by University of Melbourne with outcomes used to inform and shape further roll-out in other regional areas of Victoria.